James McMurtry On Mountain Stage The Texan brings wry, attention-grabbing storytelling to his ninth appearance on the show. James McMurtry in his ninth appearance on Mountain Stage. "How'm I Going to Find You"
"Up The Lazy River," Performed by Bob Thompson of the Mountain Stage band. 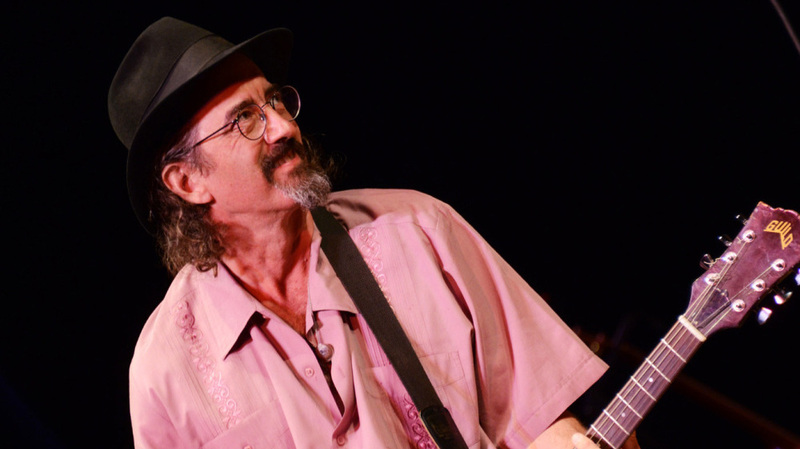 Texas singer-songwriter James McMurtry makes his ninth appearance on Mountain Stage. Drawing from his family's storytelling tradition — he's the son of novelist Larry McMurtry — he fuses wry, literate observations about the world he inhabits with the snarl of barroom rock. The result is at times sardonic, subversive and funny, but often vulnerable and always poignant. Host Larry Groce introduces McMurtry as "one of America's greatest songwriters." No slouch on electric guitar, McMurtry is joined by Tim Holt on lead, Daren Hess on drums, and Cornbread on bass. McMurtry closes his set with an attention-grabbing anthem, "We Can't Make It Here," which was lauded by influential music-industry blogger Bob Lefsetz as "the best protest song of the 21st century." "Those folks out in radio land," McMurtry warns, "are gonna hear some beeps." McMurtry is followed by Mountain Stage band pianist Bob Thompson, who performs Hoagy Carmichael's "Up the Lazy River." This segment originally aired on December 13, 2011.